Product #16558 | SKU SG2LRA6 | 0.0 (no ratings yet) Thanks for your rating! 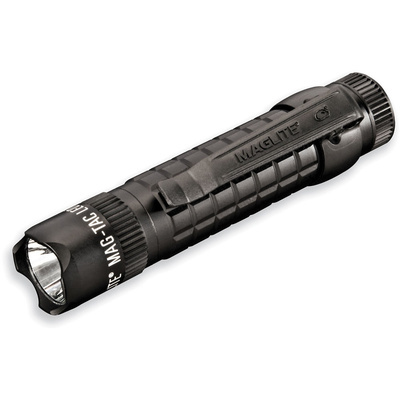 The matte black Mag-Tac LED Flashlight from Maglite is a handheld illumination tool designed for civilians yet rugged enough for tactical professionals. Its 320-lumen LED light source is capable of producing a beam visible at a range of 183 m. This configuration of the Mag-Tac has a crowned bezel that concentrates the blunt force of the flashlight housing onto scalloped edges. If an emergency requires the operator to fend off an attacker or shatter a window, the Mag-Tac's crowned bezel can make a lifesaving difference. Stand the Mag-Tac on its head and the crowned bezel will leak light onto the surface of the immediate area, great for low-level illumination like map reading. Like other Maglites, the Mag-Tac is machined from a lightweight aluminium alloy, anodised inside-and-out for enhanced corrosion-resistance, and manufactured in the United States. A weather-resistant housing, deeply knurled grip, and included pocket clip help make the Mag-Tac a full-featured illumination tool.